Prominent & Leading Manufacturer from Jaipur, we offer marble flower vase, wooden gemstone flower vase, designer flower vase, designer jaali flower vase and marble half jaali pot. 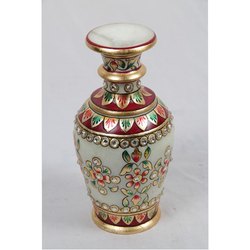 With the active support of our team of experts, we are engaged in offering a huge assortment of Marble Flower Vase. This marble artifact is offered with a colorful appeal excited by the prominent work of art combines the beauty. Designed to serve various requirements of our clients, these Marble Flower Vases are offered as per the latest trends and fashions of the industry. Size: 6", 9", 12", 15"
Leveraging on our enriched industry experience, we are engaged in offering a huge gamut of Wooden Gemstone Flower Vase. These Wooden Flower Vases are used for keeping flowers. 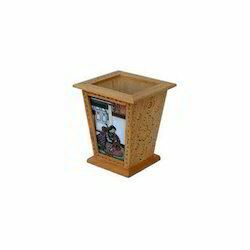 This quality assured Wooden Flower Vases are manufactured using superior grade wood and other materials that are procured form reliable vendors of the industry. These Wooden Flower Vases are available as per the tastes of our clients. 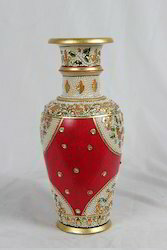 We are engaged in the manufacturing of a unique range of Designer Flower Vase. Offered range is available to our clients on reasonable prices. 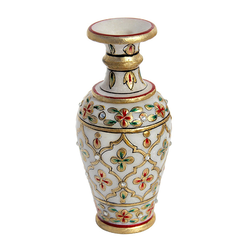 Being the leading names in industry we are into offering a quality approved range of Designer Jaali Flower Vase. These are made using fine quality material which we sourced from the certified vendors of the market. These have high capacity and are available in different specifications as per the clients requirement. 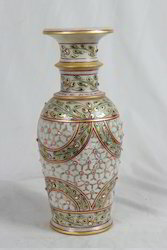 We are engaged in the manufacturing of a unique range of Marble Flower Vase. Offered range is available to our clients on reasonable prices. 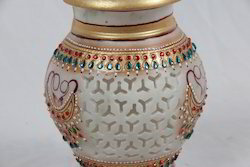 We are engaged in the manufacturing of a unique range of Marble Half Jaali Pot.Offered range is available to our clients on reasonable prices. Looking for Flower Vases ?